Bird Baths can attract backyard birds all year round. Bird baths can be free-standing, hanging, heated, fountains and bird baths come in metal, glass or ceramic. 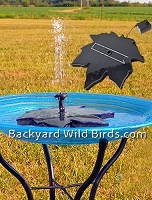 Create your own water display bird bath and the use of moving water is a strong attracter of birds. Hanging Bird Baths can also be put on Deck poles for an attractive addition to help birds and get to see them. Copper bird baths are natural anti-bacterial. 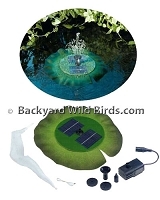 Bird bath solar fountains provide continuously circulating water bubbler or fountain for your birds. This is great because moving water is a strong attracter of birds. Water necessary for life, completes any Bird Sanctuary! 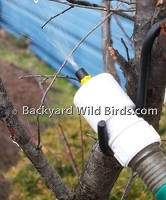 Make water available to your backyard birds! Bird Bath Heater and De-Icer keeps bird baths ice free in winter time. 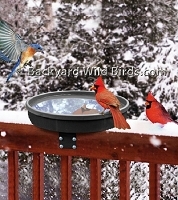 The bird bath heater has a built in thermostat that only runs below 35 degrees Fahrenheit. Bird Bath Solar Bubbler is a floating fountain powered by solar cells. The Solar Bubbler moving water attracts 10 times as many birds. No battery or electricity needed. Runs automatically with sufficient sunlight and water. Bird Bath Water Wiggler moves bird bath water to attract birds and keeps mosquitos down. Blue Porcelain Bird Bath is a decorative cobalt blue circle bowl design with a strong metal stand. The blue bird bath is a made from durable and attractive porcelain stoneware that will withstand outdoor exposure. This is a decorative blue swirl glass bird bath that includes as a strong metal stand. The blue swirl it produces is truly beautiful Glass Birdbath. Songbird friendly with textured bottoms and correct depths. Butterfly Trio Hanging Birdbath says class in your backyard, this bird bath with chain has a 3" depth and 15" diameter. Copper embossed rim bird bath adds style to a backyard patio or garden. Works well with the Copper Hummingbird Dripper Fountain or Copper Lotus flower Dripper Fountain. 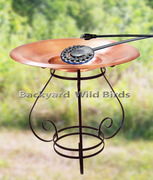 Copper Hummingbird Dripper Fountain has moving water and sounds that attract birds! The fountains water trickles down its petals and splashes gently into the water below. Very relaxing! 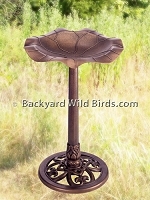 Copper Lotus flower Dripper Fountain attract birds with the sights and sounds of running water! Lotus flower with petal below design that is sure to please. Deck Clamp Bird Bath is a rail clamp mount bird bath. The bird bath adjustable clamp mount is designed to accommodate most deck rails up to 2" thick. Glass Bird Bath Iron Stand has your choice of glass bird bath, wrought iron cradle and wrought iron bronze stake as a complete set. Hammered Copper Bird Bath includes copper bowl with wrought iron bronze stake. Classy backyard Bird Bath! Hammered Copper Bird Bath Set includes copper bowl, wrought iron Bird Bath cradle and bronze stake. Classy backyard Bird Bath! Hanging Aqua Glass Bird Bath is a recycled glass bird bath that has a strong wire frame to support it. 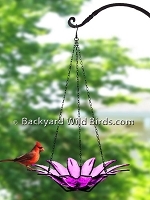 The 8" colored glass bird bath makes a nice addition hanging on a multi arm bird feeder pole. Burnt Spice Hanging Ceramic Bird Bath adds style to a backyard patio or garden. This 14" hanging birdbath is a decorative ceramic bird bath with matching metal-tailed bird. Hanging Daisy Glass Bird Bath is a recycled glass bird bath with a wire frame and chain. This 12" Fuchsia colored glass daisy petal bird bath adds a splash of color hanging in the sun. Hanging Glass Bird Bath is a recycled glass bird bath that has a strong wire frame to support it. 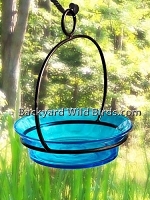 The 8" colored glass bird bath makes a nice addition hanging on a multi arm bird feeder pole. Lime is the default color but at Color Options can select Fuchsia or Orange. Heated Bird Bath Bowl with Pedestal is thermostatically controlled to keep water ice free and the bird bath usable all winter long. 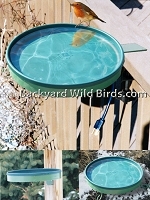 API Heated Bird bath with Metal Stand is just what birds need in a heated winter bird bath. Heated Birdbath Deicer is like a heated rock thermostatically controlled to work below 35 deg. 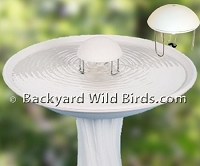 The 75 watt heater works in any size birdbath and operates automatically to keep water from freezing down to -20 F.
Hummingbird Mister attaches to a garden hose and produces a fine spray that Hummingbirds love to fly through. 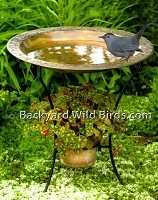 Metal Stand Bird Bath is a nice metal frame bird bath with a 14" diameter dish. 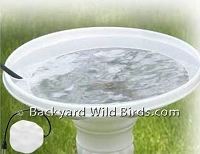 Unobtrusive bird bath is a great addition to your outdoor decor and natural attraction to bring in wild birds. Also available in terra cotta and black color bowl. Pedestal Lily Leaf Bird Bath in Antique Copper finish. This bird bath adds class to any backyard bird sanctuary. Solar Lily Pond Fountain is a pond floating fountain powered by solar cells. The solar Lily Fountain jet stream of water will vary with the intesity of the sun. Solid Copper Bird Bath adds style to a backyard patio or garden. The Solid Copper Bird Bath is a copper bird bath bowl and twig like metal base. The bird bath stake features a handsome scrolled flower twig vine. Wood Frame Hanging Bird Bath is a decorative bird bath that can be hung on a bird feeder pole or tree. 19" Western Red Cedar wood frame bird bath lets you attract birds in style. Yellow Sunflower Bird Bath is a decorative yellow glass bird bath with a metal stand. The Glass Bird Bath of a Sunflower is constructed of high quality glass, is a beautiful detailed design.